Over the weekend I had the pleasure of attending a Disneybound event put together by Dole Whip Dame. The theme? Disneyland itself! Attendees were encouraged to bound as attractions, restaurants, shops, and shows. Now the concept isn’t new to me, as I bounded as the Gibson Girl Ice Cream Parlor last spring. This time I selected the Golden Horseshoe, but I wanted to pay homage to the “original owner” of the Horseshoe, my favorite Disney gal, Slue Foot Sue. Originally The Golden Horseshoe was known as Slue Foot Sue’s Golden Horseshoe, and Betty Taylor portrayed Sue on the stage in the Golden Horseshoe Revue, and Wally Boag brought Pecos Bill to life along side her. Their characters were based upon the “Pecos Bill” portion of the 1948 Disney film Melody Time. My parasol was inspired by two items that featured Sue’s image, first is the sign that once hung outside the Horseshoe. The other is the rope text, which was on the backdrop on stage. I used images from Daveland’s amazing collection of vintage Disneyland photographs as reference. I really want to do another parasol that uses more images from the backdrop, as it was just so amazing. I found this stellar two piece vintage H bar C set and knew immediately it would be perfect for a Slue Foot Sue bound, as well as just something I would wear normally. 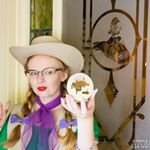 I added a pin featuring the can can girls that originally were featured on the Golden Horseshoe poster, and I couldn’t resist wearing the all too perfect Golden Horseshoe brooch that Match Accessories made. Today, Slue Foot Sue and Pecos Bill are nearly forgotten. Sue’s name has been removed from the outside of the building, and she is no longer portrayed in the shows by a Cast Member. The only remaining imagery of Sue is upon entering the saloon, you can still see her, as well as Pecos on etched glass. Sorry for all of the Disney posts lately! There has just been so much fun Disney related stuff happening lately! Can Can Girls Pin: I honestly don’t remember! Fantastic outfit! You nailed it. I’m pretty sure you’re the cutest girl who ever lived. 😍😭 So glad I was able to see you in all your glory!